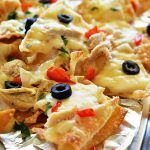 Sheet Pan Chicken Nachos are a must-make for game day or any party! Seasoned shredded chicken, black beans, cheese and more all loaded on top of tortilla chips! Shredded Colby jack cheese, black beans and lots of green onion are what make these chicken nachos heaven sent. I served ours with sour cream, salsa and guacamole and they were to die for. I kept wanting more! 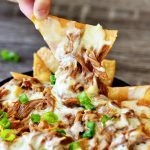 I love the ease and simplicity of these yummy nachos. 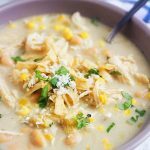 Especially with the use of the slow cooker Mexican shredded chicken. 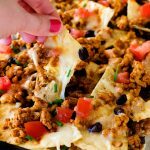 Once it’s done cooking you can whip up these nachos in no time at all. Preheat oven to 375 degrees F. Spray a 10x15 inch baking sheet with nonstick spray or line with foil. Spread half the tortilla chips evenly over prepared baking sheet. Sprinkle 1 cup of cheese over the chips. Place black beans in a medium microwave safe bowl and heat until warmed (around 45 seconds). Spread half the beans and also half of the shredded Mexican chicken evenly over the tops of chips and cheese. Repeat layers one more time ending with the cheese. Bake for 10 minutes or until cheese is melted. Remove from oven and top with tomato and green onion. Serve with desired toppings and enjoy! This looks great! I’ve made these before, but just adding whatever I had on hand. I’m definitely going to make these how you did! Yours look so much better than mine did. Thanks for sharing! Wow!!! It is perfect to eat with your family while watching movies or other bonding moments. Less expenses since this is affordable that everyone can eat unlimited without charges. Waiting for new recipe.